Annapurna Circuit Trek is a hiking in anticlockwise direction within Annapurna Massif located in the northwestern region of Kathmandu (capital city), Nepal. 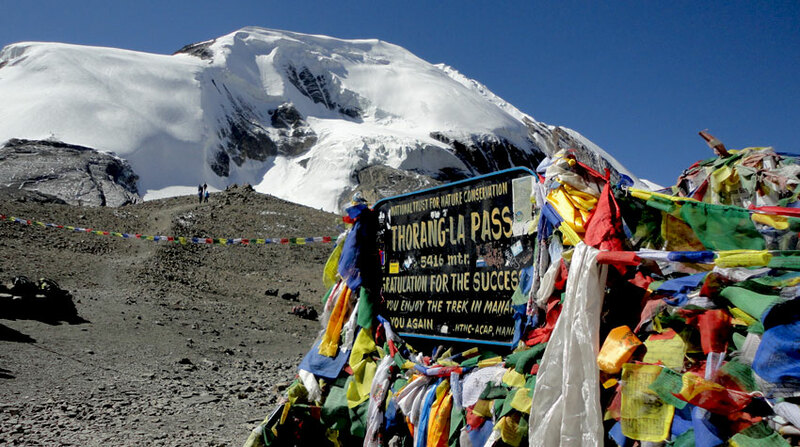 You will be touching the world's biggest trekking pass known as Thorung La Pass (5,416 m) on the 7th day of this trek. Stunning view of Lamjung Himal (6,983 m), Annapurna II (7,937 m), IV (7,525 m), III (7,555 m), Ganggapurna (7454 m), Machhapuchhre (6,997 m), Tilicho Peak (7,134 m), Mt. Nilgiri (6,940 m), including the world's 7th and 10th highest peak Mount Dhaulagiri (8,172 m) and Annapurna I (8,091 m) respectively are the gems of this tour. An ancient and sacred temple, Muktinath Temple (reached on the 8th day) is yet another attraction of this trek. It is believed that taking bath under 108 waterspouts located in the backyard of the temple will rinse the past sins and achieve salvation. Varied Nature and Culturally rich Annapurna Circuit Trekking begins with 5/6 hours 176 km bus ride from Kathmandu to Besisahar. Next day again continues to 4/5 hrs drive to Chame. This is the trekking beginning point of this trip. After 4 days walking with proper acclimatization and steadily gaining altitude, you will be crossing Thorong La Pass (5416 m - the main point of this trek). Similarly, discovering Muktinath, Jomsom, Tatopani, and Ghorepani will reach Pokhara on the 13th day. After spending one overnight at this beautiful city drive back to Kathmandu. Our 14 days itinerary for this trek is as follows. Day 01: Drive Kathmandu to Besisahar. Day 02: Drive to Chame. Trail Attractions: Small Villages like Bhulbhule, Bahundanda, Jagat, Tal, and Dharapani. Day 03: Trek to Pisang. Day 04: Trek to Manang. Day 06: Trek to Yak Kharka. Day 07: Trek to Thorong Phedi. Trail Attractions: Suspension Bridge, Ledar Village, Best views of Mt. Syagang, Mt. Gundang, Thorung Peak and Mt. Khatungkan. Day 08: Cross Thorong La Pass and trek to Muktinath. Trail Attractions: High Camp, Prayer Flags, Cross the highest passes of the world Thorong La Pass, and Muktinath Temple. Day 09: Trek to Jomsom. Trail Attractions: Beautiful Desert Landscape, Kali Gandaki River, and Kagbeni Village. Day 10: Drive to Tatopani. Day 11: Trek to Ghorepani. Day 12: Trek to Tikhedunga. Day 13: Trek to Nayapul and drive to Pokhara. Drop to your hotel and Annapurna Circuit Trek finished here! Kathmandu to Besisahar by sharing Bus. Besisahar to Chame by sharing Jeep. Twin bed sharing teahouse/lodge accommodation during trekking. Jomsom to Tatopani by sharing Jeep/Bus. Pokhara to Kathmandu by sharing Bus. Breakfast, Lunch, and Dinner at Kathmandu and Pokhara. Expenses occured due to landslide, pilitical unrest, strike etc. Wants some modification on Annapurna Circuit Trek itinerary? contact us to customize it.